This is our old sofa. Or couch, settee, whatever, They don’t say settee as much over here as in we said growing up in England, but sofa and couch are pretty interchangeable in everyday speech. That isn’t by the way an invitation to school me on correct terminology for furniture, this is just What People Say. When we moved to Davis in 2005, what feels like a million years ago now, we needed something to sit on in our apartment living room, as you do, so we found this little couch (someone called it a ‘loveseat’ but come on, that’s just another euphemism for the bottom, I’m not falling for that one) at Cost Plus World Market (“Cost Plus”, why would you call your shop that? It’s like calling your shop “Value Free” or “Save Less”). It wasn’t expensive but it was very comfy. This very comfy couch stayed very comfy for almost eleven years, but we have outgrown it (especially with our ever-growing son), plus it had started to smell, and we wanted something that would make our living room feel more comfy. We went to Ikea one Saturday afternoon, bought a big L-shaped sectional sofa, which came next day and they took this one away. Au revoir couch. 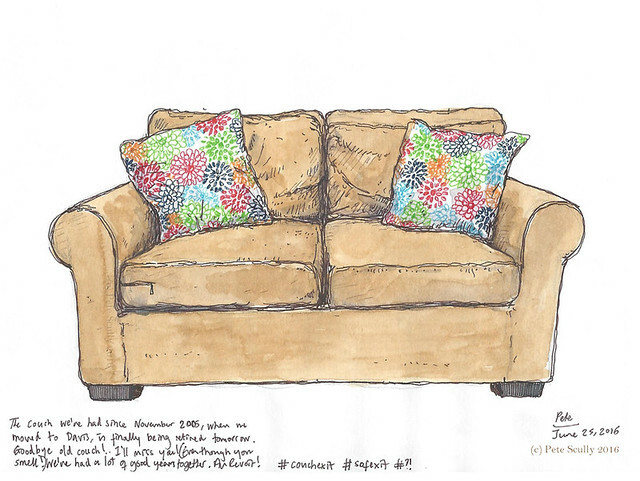 “We’ve come sofa.” So on its last night in Davis I sketched it, giving it all the old #couchexit and #sofexit nonsense, pointing out that I’m glad when we voted to get rid of the old couch we at least had a plan in place for its replacement, that we wouldn’t be sitting around on the floor for weeks while we decided what couch to get, etc and so on. Our new couch, an Ektorp if you must know, is very nice and I love it. I don’t miss the old couch one little bit. We kept the cushions though. They are lovely aren’t they. My new sofa is the best. I love it. I stayed at home for most of 4th July to just sit on it, watching movies, playing video games, reading, just to enjoy it. That old sofa was just feeling yeaurgh and the cushions had pretty much lost their comfiness so good riddance. Love that zip detail, someone hasn’t put the zip at the back when they’ve plumped the cushions – drives me mad! Believe me, that cushion needed turning around. It was looking a bit gross. Eventually. Right now I’m just enjoying sitting on it so much! How much loose change and other amazing oddities came up from the nether regions of the couch? It’s a whole new underworld down there; people have found long lost grannies and everything. Should have been enough cash to at least treat yourself to a few bottles of beer. I love the sofa art and whatever you call it, it looks great as art. You’re right about the throw cushions, definitely keepers too. buying new things for the house really brightens the mood, we just did that recently and how it affects how I feel is kinda shocking. LOL.